The ugly truth: I've probably listened to this less than a dozen times since it was released. It's not bad, mind you, not by a long shot. It's just that I like Cheap Trick a lot better when they're doing songs that they've written. Don't get me wrong: if they must perform outside material, I heartily prefer Lennon/McCartney to Diane Warren or whoever those two hacks that came up with "The Flame" were. Still, our tastes are what they are, and for better or worse I'd much rather hear "He's a Whore" than "She's Leaving Home." In a way, though, this album makes perfect sense for me, because the only reason I ever really went back and delved into the Beatles' catalog is Cheap Trick. Prior to becoming obsessed with Rockford's most famous sons, I'd always considered the Beatles to be - gosh, there's no way to say this without sounding like a jerk, so here goes - old fart music. I dunno - as a teenager, the music of the Beatles always just seemed quaint to me, something that my parents liked that was just too old-fashioned for my tragically modern pubescent self. I know that these are considered "bad thoughts", especially coming from someone writing a half-music blog, but 'tis how I felt at the time. I eventually began to listen to the Beatles in a decoder-ring sense; I knew that Rick Nielsen and his cohorts were huge fans, and I knew that Cheap Trick's music was probably laced with no shortage of Beatles references. I went back and found out (yeah, I found out) that there were, and gained a better appreciation of the importance of the Beatles' catalog in the process. Even now, I've never really come to think of the Beatles' songs as "my music"; I still appreciate them in a museum-esque sort of way rather than actively and passionately. Still, I remain glad that the Cheap Trick catalog sent me backwards and allowed me to discover for myself the sheer importance of the Fab Four. If nothing else, I consigned the designation "old fart music" to the dustbin of ignorance permanently, and stopped sounding like a teen-dork dope (in one way, anyway) in the process. Back to the present: Sgt. Pepper Live exists largely as a souvenir, as far as I can figure. 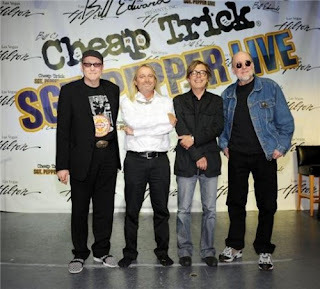 Cheap Trick performed Sgt. Pepper in a few locations around the United States before settling in for a successful residency performing it in Las Vegas. You've gotta have something other than just t-shirts for all those tourists to pick up at the merch table on the way out, right? Right, and I'm grateful to the band for having the good sense to make the CD a general release, easily accessible to obsessives like me who'd be more likely to fly to Vegas to hear them do their own material than to hear them cover someone else's. It's pretty much what you'd expect: a bit heavier with a few tempos pushed up a notch or so, but more or less true to the original piece. Honestly, I can't imagine anyone really listening to this as much as or in place of the original, but as a neat change of pace or a cool souvenir of the performance, it does what it says on the cover. Also available on DVD: same title, same artwork, same track list. If nothing else, it is pretty cool that Cheap Trick managed what the Beatles themselves thought couldn't be done and were able to pull off the Sgt. Pepper material live. Pretty good bragging rights for boosters like me, anyway. Next week: Solo albums, offshoots, side projects...and a Hanson mention? Really?